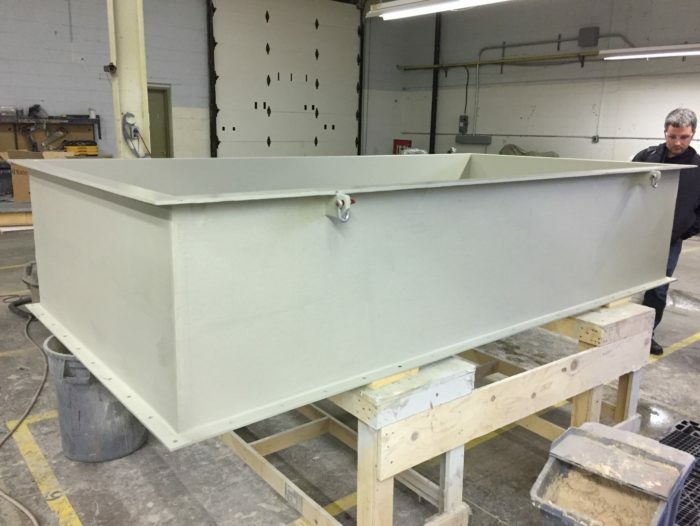 The experts in composite materials products, Competition Composites Inc (CCI) was in the process of converting all-metal transitional ducts to fully composite materials designs. One of the biggest advantages of composite materials is their significantly reduced weight at comparable strengths to metal alloys. Being that these transition ducts were sizeable, measuring 9 feet long by 4 feet wide, and ranging in height from 2 to 3 feet, the difference in weight afforded by an all composite design was substantial. Each duct was modeled as designed in SolidWorks and imported into Autodesk Simulation Mechanical for the structural FEA. Being a composite structure with multiple bodies of various composite material layers and amounting thicknesses, it was important to create material properties for each material layer and build a composite ‘sandwich’ for each body of the duct. In doing so, the analysis revealed a more accurate result dependent on the individual properties of any given layer of the composite rather than treating each body as a bulk modulus representation. The structure of each duct was similar in that each duct was composed of a top and bottom mounting flange and four thick side walls all bonded together. The bottom flange was to be mounted via bolts to a rigid, metal structure, and the top flange was to be clamped against a receiving duct via 8 pneumatic clamp heads, which applied a force along the entirety of the top flange. In operation, the ducts would experience pressure forces and vacuum forces from the oscillating volumes of air moved through them. 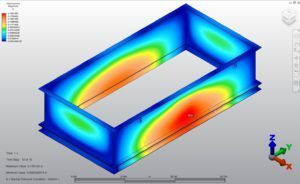 The structural FEA analyzed the integrity of the designs for given composite layup schedules for the bodies of the ducts. The results of the analysis demonstrated the stresses and deformations of the top flange due to the pneumatic clamping and sealing forces applied, as well as in the cored sidewalls. The specifications of the designs dictated that the operational forces imposed on the ducts should not results in a deflection of the top flange of more than ¼” and that the safety factor should be no less than 4 for the entire structure. Through NLS’ efforts, CCI had results that validated their designs and provided a level of confidence that the as-built ducts would perform to expectations. CCI has since built all three transition ducts and they are ready to be shipped to their final destinations.